Santa Clara Weekly- "Imagine listening to an audio interpretation of “Twinkle Twinkle Little Star” where the playful song launches with primitive beats, veers into Native American rhythms, and then travels through the many different periods of American music. 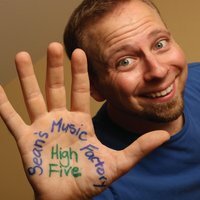 Such is “Time Travel Twinkle,” a new track in Sean’s Music Factory’s second children’s music album, “High Five.” Many pieces on this album mingle fresh, kid-friendly tunes with upbeat alternative rock." San Jose Mercury- "Interaction is a keystone for Mendelson's performances"
"Like" Teacher Sean's Music Factory on Facebook or go to www.seansmusicfactory.com for lyrics, videos, shows, and booking information. Except “Going to the Trains”, written by Phil Schroeder and Mitchell Schroeder, © 2007 with additional lyrics by Sean Mendelson. Jillian Mendelson wrote “Pouring Housetop”. Twinkle, is traditional material arranged by Sean Mendelson. “Over in the Bay” has a traditional melody with new lyrics and arrangement by Sean Mendelson. This album’s packaging left no carbon footprint because the paper materials are 100% recycled and any carbon usage was offset. The plastic in thecase was made from recycled water bottles….Say What! This album is for the whole family to enjoy. So everybody please sing and dance along! Thanks to all my present fans for coming to shows. Please become a Factory Family by attending a show and having fun making music with me. A note about my Twinkle arrangement: I wanted to take the melody from primitive times before America was America, all the way to present. Thanks to Brad, Mona, Terry, John, Kevin, Jillian and Logan for performing on this album. Special shout-out to Girlfriend, the dog who inhabits Terry’s recording studio through the long process of making an album. Terry is the best producer I’ve ever worked with! I have the greatest family, so I must give a never ending thanks to Jillian, Logan, and Katie and the rest of my extended family. Bradley Okamoto, Patti and An Chen, Brandon, Rachel and Rebecca Wong, The Henrys, Hailey Humphrey, Sophia Zhang, Natasha and Clayton Mar, The Quok Family, The Dawson Family, Jennifer Knapp, Leyli and Mila Hariri, The Townsend Family, Lina Pachikov, The Kushner Family, The Boyle Family, Abigail Tonnis, Debbie Mendelson(mom), Lee Mendelson(dad), The Cabell Family, The Bautistas, Fran and Chuck Rible, John, Gaby, Gianna, and Carlo Gemetti, Alicia. Sean Mendelson- lead vocals, acoustic and electric guitars, backing vocals, bass(except 2, 11), piano on 12, keyboard on 2, 5, 16, percussion on 2, hand claps on 11, 16. Terry Carleton- drums and percussion, bass on 2, 11, backing vocals on 1, 5, 10, 12, 16, orchestra bells on 2, 8, air organ on 8, keyboard on 10, claps on 11(with Cindy). Brad Okamoto- fiddle on 1, 2, 16, saxophone on 5. Logan Mendelson(my 6 year old)- sings on 2, 4, 5, 6, 8, 11, 12, 15, talks on 3, 4, 5, 7, 15, gurgles on 6, laughs on 16. Jillian Mendelson(my 4 year old)- sings on 2, 8, 9, 11, 15, talks on 15 and laughs on 16.